I forgot about this, but I had a Chief Cherokee as a boy. My brother had Johnny West, the Chief's cowboy counterpart, so he must've been more of a Western imperialist. As a Facebook friend reminded me, Marx offered Geronimo, Fighting Eagle, and Princess Wildflower as well as Chief Cherokee. On the cowboy side, there was Col. Custer, the villainous Sam Cobra, and a whole West family. Plus horses, wagons, and a fort. This must've been when I was around 10 or 12. I also had a souvenir totem pole allegedly carved of ivory. As well as my Hopi kachina coloring book and the robot kachina I made in arts and crafts. Funny how I forgot about Chief Cherokee and the totem pole. I had more Native influences in my childhood than I realized. Of course, I didn't think about why a Plains Indian was named Chief Cherokee. Stereotype alert! 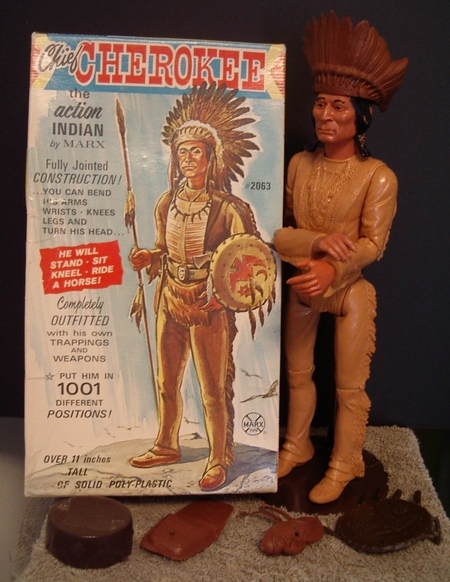 For more on Native-themed toys, see Comanche LEGOs Based on Lone Ranger and Happy Meal Characters Stereotype Indians.